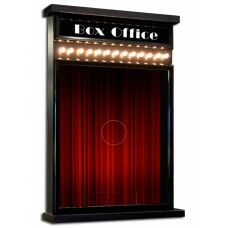 This beautiful Deluxe Box Office will add a realistic touch to your home theater entrance! Constructed of metal, wood, and mica with a plexiglass window, Made in the USA. The front has a snap style opening to put your own photos or props inside. The optional color curtain photo will add a further sense of realism but is not necessary.